BORICA AD, a company with 50-years history and experience in providing specialized solutions for over 30 financial institutions in Bulgaria and neighbouring countries, has chosen the WAY4 digital payment software platform to transform its core business. The platform is licensed by OpenWay, a global software provider ranked a leader in digital payment solutions and white-label digital wallets. BORICA AD has launched this digital transformation project to enhance its existing and provide new value-added services. OpenWay will supply a full end-to-end card processing solution for both issuing and acquiring including real-time fraud prevention and detection, e-commerce, mobile wallet and tokenization. The new platform shall enable BORICA AD’s future business growth including cross-border services’ expansion. Without the new platform, BORICA AD would not have been able to scale the growing business and boost ROE. The processor was looking for a solution that would support local, regional and international card payments, ensure uninterrupted business operations, provide automation of back office processes, and increase speed to market. The decisive factors in choosing OpenWay and the WAY4 platform were its flexibility as well as the commitment to deliver on time and allow BORICA AD to expand its new business services to include tokenization, digital wallet, new card products, new institutions among others. “The project known as “BORICA New Generation” will impact significantly the whole card payment environment in the country”, says Radoslav Dimitrov, head of “Cards and Terminals” Division at BORICA AD. “The tender procedure has been held among more than 10 leading international card system vendors and completing all its stages took us nearly two years. OpenWay managed to cover all our requirements for flexibility, security and business expectations. Today we are confident that this partnership will change the future of card business in Bulgaria”, he adds. “We appreciate that BORICA has entrusted the transformation project to OpenWay. We have extensive experience in analyzing the architecture and delivering highly reliable solutions for national and regional switches, and are ready to share this expertise with the project team,” - notes Sophocles Ioannou, Regional Manager at OpenWay. BORICA AD has developed and nowadays provides and operates the technology infrastructure of the Bulgarian payment industry. In doing so, the company has been a trusted partner of banks and payment institutions for nearly 50 years. The Company is committed to providing modern and innovative solutions to financial institutions. Company’s services focus on payment services, card services incl. authorization and terminal driving, fraud prevention services, secured card payments, HCE, mobile payments and Card Management System as a service; SWIFT Service Bureau; e-signature and e-invoice, Infrastructure services. BORICA AD acts as a third party processor (TPP) for MasterCard and VISA. The Company is licensed by the Bulgarian National Bank to operate three payment systems (BORICA Payment system for card payments, BISERA 6 for credit transfers in domestic currency and BISERA 7 for SEPA credit transfers and direct debit in Euro). Mastercard Payment Transaction Services S.A. (MPTS), a European processor, rolls out a new digital payment solution that leverages Mastercard Digital Enablement Service (MDES) tokenization for secure payment card provisioning on mobile devices. The solution allows Mastercard Issuers to easily deploy the latest mobile pay schemes including Apple Pay, Android Pay, Samsung Pay as well as to enable mobile payments on wearables. The project has been implemented together with OpenWay, a software provider ranked #1 by Gartner in digital payment solutions. New solution is already used by banks across Europe and allows their cardholders to pay on the go with use of Apple Pay and Android Pay or card issuer’s mobile wallet – both in-store and online. The speed and EMV-level security of these payments are guaranteed by the use of tokens instead of actual PAN. All Mastercard transactions go through the MDES platform, which manages tokens and converts token to card number and vice versa. WAY4, an OpenWay’s card processing platform used by MPTS for card issuing, supports real-time interface to MDES and manages authorization, clearing and settlement for all tokenized transactions. “This new solution allows us to be an innovative processor that enables all our clients to follow the latest trends in the world of digital payments. Together with our vendor OpenWay, we provide a very attractive time to market for such services, which is now key success factor for our clients participating in the process of digitalization”, – comments Marek Sagan, Member of Management Board Mastercard Payment Transaction Services S.A.
“Interest in tokenization solutions in banking and e-commerce community is driven by immense growth of mobile commerce. OpenWay has completed more than 10 tokenization projects in Europe and Asia, being the first vendor to launch Apple Pay and Samsung Pay together with banks in a few countries. We believe that the project with MPTS is extremely important and timely for European markets because of high mobile phone penetration, well-developed POS terminals infrastructure, and consumers awareness and high expectation of contactless technology”, – says Maria Vinogradova, Director of Strategy and Market Intelligence, OpenWay. About Mastercard Payment Transaction Services S.A. Established in 2008 Mastercard Payment Transaction Services is a European payment processor. Headquartered in Warsaw Poland, with business teams located in Frankfurt, Munich, Paris, Madrid and Lisbon. The company provides its customers with end-to-end innovative processing solutions and it has experienced very dynamic growth over the past few years. In addition, Mastercard Payment Transaction Services S.A. supports banks, fintechs and retailers in introducing innovative payment products and is heavily oriented on best practices as well as state-of-the-art technologies of the payment industry. The company is a part of the global Mastercard Processing division with over 2,500 employees supporting customers in 70 countries worldwide. OpenWay, a recognised leader in software for bankcard acquiring and issuing, digital banking, omni-channel payments and e-commerce gateways, has launched a multi-currency pricing software solution to help acquirers attract and service international e-commerce merchants. Globalisation dictates its own pricing rules for businesses. Customers want to purchase globally, and merchants are eager to price locally while avoiding multi-currency reconciliation and multiple overseas acquiring relationships. For an e-commerce gateway provider (acquirer or PSP), offering merchants services that include currency conversion could lead to significant additional revenues. Merchants and PSPs could also benefit through profit-sharing agreements with their acquirers on FX conversion rates etc. WAY4 Multi-Currency Pricing is an integrated software solution for acquirers which enables their merchants to price goods and services in a variety of foreign currencies while continuing to receive payments in their home currency. It helps to increase merchant sales, reduce cart abandonment and avoid back-office payment administration headaches. The WAY4 solution allows acquirers to set up unlimited pricing and settlement currency pairings, manage mark-ups for different FX rates, settle with merchants and PSPs in their chosen currencies, and generate detailed merchant reports. Merchants with high international sales, such as airlines, global e-commerce retailers, marketplaces and those in the hospitality, gambling and online gaming sectors, are attractive prospects for acquirers. However to service these merchants, acquirers need to be able to offer multi-currency capabilities as well as 24/7 availability, card-based and alternative payment methods, and advanced tools for online fraud prevention. WAY4 Multi-Currency Pricing is already deployed by two leading European acquirers. Together with WAY4 DCC this solution enables an acquirer to gain incremental revenue from merchant transactions while providing a user-friendly service to cardholders worldwide. These solutions are part of the WAY4 Acquiring platform developed by OpenWay. With WAY4, acquires can create comprehensive merchant hierarchies, flexible rules for authorisation and settlement in the preferred currencies, real-time risk monitoring, loyalty, dispute management, and high availability. WAY4 is built to meet the requirements of international businesses, including support of multiple currencies, time zones and languages. October 4, 2016, Moscow — Sberbank clients, holders of Mastercard® cards, can now use Apple Pay, which will let them make secure and convenient contactless and online payments. “Apple Pay is driving the popularization of contactless payments in Russia and globally. Many Sberbank clients actively use new technologies, and an increasing number of them will prefer cash-free and contactless payment using their smartphones,” commented Alexander Torbakhov, Deputy Chairman of the Executive Board of Sberbank. Security and privacy are at the core of Apple Pay. The service leverages the safe and secure Mastercard Digital Enablement Service (MDES) platform of Mastercard, which uses the most advanced payment technologies – EMV, tokenization, cryptography and biometrics – to ensure the integrity of cardholder information. When a client adds a Mastercard credit or debit card to Apple Pay, the card number is not stored on the device or Apple’s servers. Instead, a unique ID is assigned to each device, which is encoded and safely stored on the device’s Secure Element chip. “Mastercard is a technology leader and we are committed to bringing innovations to the Russian market and by doing so, we get Russia to the digital future. 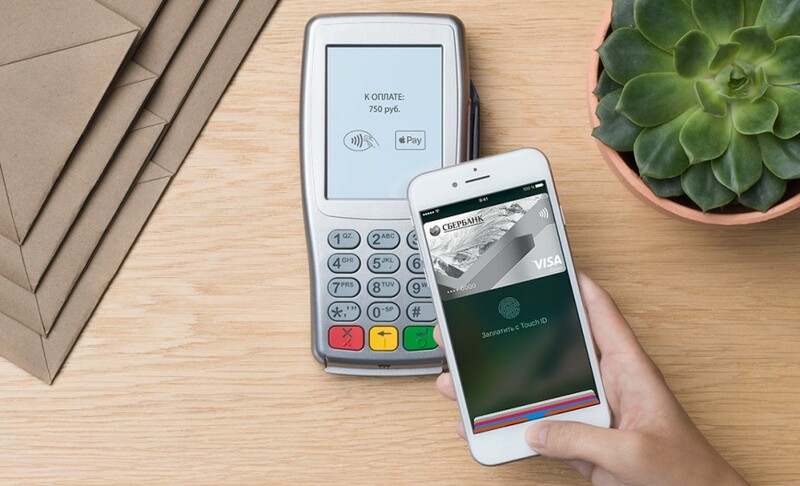 With the launch of Apple Pay cardholders have a safe, easy and private way to pay for everyday purchases with their favorite devices – when, where and how they want,” said Alexey Malinovskiy, Head of Mastercard Russia, Kazakhstan, Belarus and Armenia. Apple Pay can be easily set up in the Sberbank Online mobile application, which is familiar to all Sberbank cardholders. Users can enjoy contactless payment service while continuing to receive all the benefits from using their credit and debit cards. In stores, Apple Pay works with iPhone SE, iPhone 6 and later, the Apple Watch. Online shopping in apps and on websites accepting Apple Pay is as simple as the touch of a finger with Touch ID, so there’s no need to manually fill out lengthy account forms or repeatedly type in shipping and billing information. When paying for goods and services on the go in apps or Safari, Apple Pay works with iPhone 6 and later, iPad Pro, iPad Air 2, and iPad mini 3 and later. You can also use Apple Pay in Safari on any Mac introduced in or after 2012 running macOS Sierra and confirm the payment with iPhone 6 or later or Apple Watch. Mastercard contactless payments are available in 77 countries with 6 million acceptance points around the world. For more details about Apple Pay, please visit follow the link. Sberbank is Russia’s largest bank and a leading global financial institution. Sberbank holds almost one-third of aggregate Russian banking sector assets; it is the key lender to the national economy and the biggest deposit taker in Russia. The Central Bank of the Russian Federation is the founder and principal shareholder of Sberbank owning 50% of the bank’s authorized capital plus one voting share, with the remaining 50% held by domestic and international investors. Sberbank has more than 135 million individual customers and more than 1 million corporate clients in 20 countries. Sberbank has the largest distribution network in Russia with almost 17,000 branches, and its international operations include UK, US, CIS, Central and Eastern Europe, Turkey and other countries. Mastercard (NYSE: MA) is a technology company in the global payments industry. Mastercard operates the world’s fastest payments processing network, connecting consumers, financial institutions, merchants, governments and businesses in more than 210 countries and territories. Mastercard products and solutions make everyday commerce activities – such as shopping, traveling, running a business and managing finances – easier, more secure and more efficient for everyone. Follow Mastercard on Twitter @MastercardNews, join the discussion on the Beyond the Transaction Blog and subscribe for the latest news on the Engagement Bureau. B1NK, a digital only bank for new generation in Kazakhstan, is now chatting with customers via Telegram. This is the first bank bot in the region where customers can send money to friends, manage their cards and keep up-to-date on B1NK promotional offers – all via a popular messenger service. Friendly chat bot B1NK (@b1nkbot) speaks three languages – Kazakh, English, and Russian. It answers user’s questions about ATM and branch locations, currency exchange rates, and even how bots spend their free time. Users can also request a call-back via the @b1nkbot. For customers, messenger banking means they have an always-on digital finance assistant. After they sign in, @b1nkbot can show them their transaction history and card balances, help them to block cards, set card transaction limits, and even to make mobile money transfers to friends. To send money, the user simply chooses the contact and specifies the transfer amount — no other information is required. The recipient receives a message confirming the transfer and is asked to choose a convenient way to receive the money (for example, transfer to a card or to a mobile phone account). ‘Today only a couple of tier-2 banks in Kazakhstan offer mobile banking services. There’s definite potential for growth in this area, because people in Kazakhstan are tech-savvy and ready to embrace technological innovations. B1NK’s aim is to simplify banking, and to make finance management more convenient’, - Gani Uzbekov, CEO, Capital Bank Capital Bank Kazakhstan (B1NK) says. The service is based on WAY4 Messenger Banking, an innovative white-label solution which facilitates customer service via messenger applications. The solution is developed by OpenWay, a recognised leader in software for bankcard issuing and acquiring, payment switching, digital banking and omni-channel. The solution supports customer service via all popular messengers, including Facebook messenger, Viber, WeChat, Telegram and Line. It can be integrated with any card processing system. ‘We are happy for our creative partners at B1NK. The bank’s team is always open to discuss new ideas and is not afraid to experiment. The launch of @b1nkbot is a first for both our companies. B1NK is OpenWay’s first client to use the WAY4 platform for a completely digital bank, which focuses on serving customers via online channels only i.e. mobile banking and social networks’, - Dmitry Dovgal, depute business development director, OpenWay, notes. Messengers are friendly environments. Banks are beginning to realise the potential of interacting with customers in a new way, in the customer's language, using a familiar chat format. Banks are always available to their customers, irrespective of their location and device. Messenger banking is an automated alternative to more expensive SMS channels and supplements the service from call centres. Additional features, such as p2p money transfer and interactive photo, video and audio content, can also be used to attract new customers. According to statistics, messengers are an extremely popular communication channel for those aged 16-44.